Further Comments: Part of a rash of sightings of ABCs in and around the Ipswich area during 1996, and that have continued well into the 2000s. Further Comments: A driver watched a pillar of smoke rise up and form the shape of a young man. The driver believed that the figure was someone who had died nearby. Further Comments: A family driving home one night watched as a bright light manoeuvred around the sky, before disappearing vertically into the clouds at a fantastic speed. Further Comments: A driver braked as a man in dark grey clothing and a trilby-like hat stepped out in front of their car. The driver then realised the man had vanished, with no means of passing without the driver seeing. The figure may have also been spotted by a dog walker, who reported a man in old fashioned clothing who tipped his hat before disappearing. Further Comments: Pictures on the walls have been seen turning themselves, while a female witness with her daughter watched a Victorian woman walk by them, passing through a closed glass door. 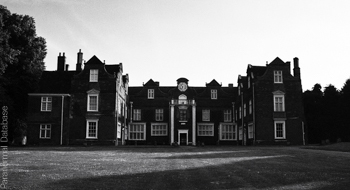 A much older report stated that the mansion was haunted by a maid with two children, who laughed and danced around the building. Further Comments: A face of a woman looks down from the window in bedroom 2, even though the room is empty. Mild poltergeist activities have also been reported, the piano has been heard playing itself, and a crashing sound, as of a wardrobe falling down, also reported. Further Comments: A local vicar was called in to exorcise this entity which threw items through the air and scattered an unknown powder around rooms. Further Comments: The local paper reported that two people had seen a large cat, 'very black' in colour, in separate incidents. The first was along Felix Road at around 03:30h, followed by the Foxhall Road sighting two hours later. One witness said that the cat was not as big as a panther, but was much larger than a normal cat. Further Comments: A medium who came to cleanse the flat failed to do so and the tenants finally moved out. They had reported poltergeist-like activity, loud bangs and footsteps, the muffled sounds of a baby crying, and black and grey shadowy figures. Further Comments: This ghostly white lady has been seen by several witnesses in the upper part of the hall. One person reported a strange mist emerging from the chimney, though no fires were burning within. Further Comments: This ghostly woman who has been observed walking through a wall is said to have died in a fire on the site. Further Comments: Several staff at this building reported a shadowy figure walking around the rear corridors near the protection booths. Further Comments: While alone in the gents' toilets, one man heard the door open and close and heavy booted footsteps approach. Then, after hearing a loud sigh in his ear, the witness turned but to see who had come in, but realised he was alone. Further Comments: Part of a rash of sightings of ABCs in and around the Ipswich area during 1996. The cat was nicknamed 'Paws' by the local press and a reward was posted for evidence. In the 2000s a witness came forwards to say that the 'cat' was actually a black Labrador which would run freely around the area, and most locals were aware of this at the time. Further Comments: Believed to be the ghost of Mother Lakeland, a wise woman / witch who once lived in the area, this entity has been blamed for moving displays around the shop. As a side note, contained within the shop is a fifteenth century chapel that remained undiscovered for many years. It is now open to the public. Further Comments: A driver and passenger reported seeing a young kangaroo travelling along a busy Ipswich road. Further Comments: If you place your ear on one of the walls of this Irish theme pub, one can hear the faint beating of a human heart. Maybe it was the same entity which once turned the all the fuses off at a junction box, saving the landlord from electrocution. In 2004 a visitor staying at the pub awoke to see a little girl in the room, even though the only other person there was the publican. Further Comments: Two dull, spinning lights followed a teenager driving across the bridge for several miles. The lights remained in front of the car at all times, turning as she did. Several other witnesses reported seeing similar lights around the Nacton Road area at roughly the same time. Further Comments: This pallid person spotted standing around the area could be the phantom of one of many suicides which have occurred on the nearby Orwell Bridge. At least one witness has heard the sound of an invisible horse. Further Comments: This building is said to be haunted by the ghost of a teenager who died within. He appears on CCTV cameras, but is not visible in the real world. Further Comments: The appearance of small child in a nightdress over this decade was also accompanied by strange noises and footsteps heard moving in the upper parts of the house. A mist with unidentifiable smell was also reported moving from room to room. Further Comments: A former occupier at this site recalled seeing a white, semi- transparent shape of a young boy with white or blonde hair. Though the clothing was hard to distinguish, the witness could clearly see the smiling face of the figure. Further Comments: A female witness alone in a house looked down from the landing to see a slim old man dressed in a 1930's suit and hat standing halfway up the stairs holding the banister while looking up at her. The man appeared �real', but the witness knew he was not. He seemed to stare right through her as if looking at something else. The witness stared at him for what �seemed like an eternity', trying to work out who or indeed what he was. Finally the witness became unnerved and turned around to escape the scene - when she glanced back the man had vanished. Further Comments: The Evening Star newspaper reported that Lee and Michelle Markwell had experienced several strange occurrences in their home, including footsteps, electrical items turning themselves on, and feeling something brush past. The couple videoed 'orbs' in their home, mostly likely dust particles close to the lens. 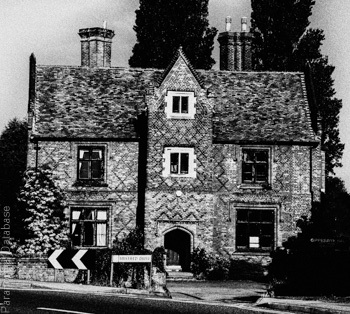 A paranormal team, Suffolk Paranormal Research, which investigated the site said the haunting was caused by an elderly farmer named William and Rachel, his sister. Further Comments: Doors opened and footsteps could be heard climbing the stairs in this home. After a female form was spotted in one of the bedrooms, the house was exorcised by a church pastor.